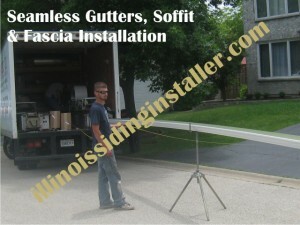 Seamless gutters have established themselves as the most popular kind of gutters. Also known as continuous rain gutters and seamless rain gutters, seamless gutters account for about 75 per cent of all American gutters. The popularity of this kind of gutter system is down to its functionality. 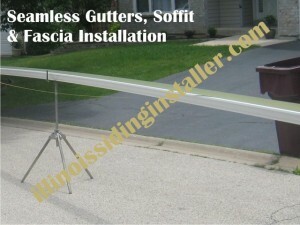 Not only do seamless gutters get rid of unsightly seams, but they also reduce leakage. Enamel is used in the finishing of these gutters, meaning that you will never find the need to paint it. The gutter will be formed on the site where it is going to be installed, so that exact measurements can be taken. There are various colors of seamless gutters to choose from, and the process of installation will take less than 24 hours. If you’re looking to keep your home’s beauty intact and improve overall drainage properties, it is beneficial to install seamless gutters. Rain water can accumulate in large quantities sometimes and cause inconveniences to homeowners. By installing a gutter system in Chicago, the rain water can be collected from your roof before it is dispersed away from your house. It is very essential to install downspouts (drain pipes, leaders) that are properly configured. If there are faults while a guttering system in being installed, it may lead to damages to building foundations, walkways, driveways, shingles, landscaping, soffit, and fascia. Regular maintenance is required to ensure that the guttering system protects your home. It is important to keep your gutters free from leaves, debris, bird’s nest and shingle granules. Neglecting it can result in deterioration, make the fasteners loose, thereby forcing immediate repairs so as to prevent further damage of the gutters. It is essential to hire qualified and experienced contractors to carry out installation of seamless gutters in your home. Whether you’re looking for the stability of aluminum or the beauty of copper, a professional contractor can help in designing the most attractive look your home has probably ever had! You will enhance the aesthetic appeal of your home and add value to it, give us a call or click here to find out more about – Chicago gutter installation.